too prudish or too offensive? As a freelancer, I have a lot more freedom than my employed counterparts (something that I've used over the years to challenge and change national policy and legislation, openly argue with some of the direction that sector bodies suggest their members should be taking, and so on - in effect, being a 'modern day prophet'). But while this may sound quite exciting and glamorous, there is also an associated risk - in not being part of an ongoing team, having a line manager, and such like, there's a risk that I may start to believe my own hype, and end up 'going off on one'... which is something I've always sought to avoid through how I've designed part of my business model. And this usually plays out ok - but sometimes it may mean that I go a step 'too far'. I recently tweeted whilst on my way to deliver a workshop for a client that would be being attended by a range of people thinking about starting up their own business in the future. I glibly referred to the fact that I was looking forward to busting some of the myths and hype that surround business plans and included a picture of some of my 'learning aides' that any who's ever been in one of my courses will recognise. For 14 years no-one has ever had an issue with any of these types of toys/gimmicks/props (with the exception of one person who suffered from the diagnosed medical condition pediophobia), but on this occasion, my client phoned me within minutes to ask me to delete it as they felt some people may find some of the content offensive. Now - I'm not their employee, and neither did our contracted terms relate to anything which said they could direct what I could or couldn't say in my own right, so I could easily have said 'no'. But I've always had the approach that if someone's not happy with something that's happened, my first response isn't to find excuses or dodge potential blame, but rather find the quickest way to fix things so everyone can keep on getting along. 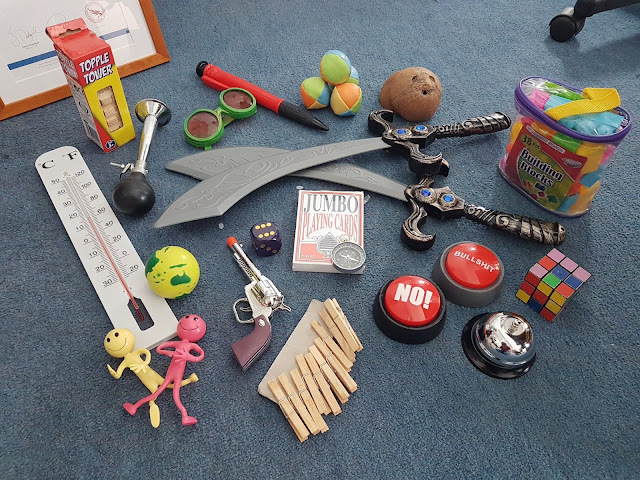 But, being me, I surreptitiously sought a view from the people attending the workshop about the items in the picture - asking if any of them were offended by any of them (some of which have also featured in national prime-time tv shows). They all said that they couldn't see any problem with any of them. Which leaves me wondering - are clients sometimes too prudish in what they think others might think, rather than asking those same people, before acting on imagined fears; or am I starting to push the boundaries a little too far...?